A little story about traveling the world + a recipe for a refreshing Tomato Salad with Basil Vinaigrette. Hi Hello! Wow, it has been a while, hasn’t it?! I took a break from blogging because I’ve been very busy this year! After leaving Israel I came home for a week to visit with family and friends before packing up again and traveling across some of Europe, an adventure that changed how I view life. Now I’m home and employed and super happy to be back in my kitchen. While I was traveling I experienced new foods and cultures and a crazy new way of life, and I’m excited to share a little bit about that chapter with you (and a recipe, of course!). I initially went to Europe as an au pair. I arrived in Rome on an unseasonably warm and sunny day for February in Italy. 1/4 of my host family met me at the airport; a man named Mario. I was full of excitement and nerves, but I was mainly really happy to finally be in Italy. I had dreamt of visiting Italy my whole life; my parents and I lived there when I was a baby so I grew up hearing stories of small towns and gelato and pizza. I was instantly mesmerized by the land; Italy is unlike any place I’ve ever been. The endless green and stark white of snow capped mountains with a wildly blue sky will forever be stamped into my memories. The events that followed both broke me and strengthened me, and they led to my greatest adventure so far: two months of solo travel through Europe. The au pair job didn’t work out. I’d love to say that the host family and I simply weren’t a match, but it was more than that. It’s quite a long story but more important is what followed, a magically transformative and healing time in my life. With an enormous amount of support and love from friends and family near and far, I held my head high, booked a train ticket and packed my bags. In a span of two months I traveled through 20 cities in 8 different countries, an opportunity that may never have come my way had things worked out with the au pair family. A lot of people along my path made me feel better about my circumstances. One man in Cinque Terre said it best; he was traveling with a companion from home who went to the same university as my sister, which sparked a two-hour long afternoon conversation overlooking the ocean, enjoying locally made white wine. He said to me “sometimes bad things happen in order to lead us to the good things in life,” and he was right. I met dozens of people along the way who helped me and taught me, I saw sights and sat on beaches and experienced new cultures and different people. I struggled and grew and laughed and cried. And I experienced some of the best food of my life. I’m happy to be back in the kitchen and I’m really looking forward to using some of my food knowledge and inspirations that came from my time abroad. 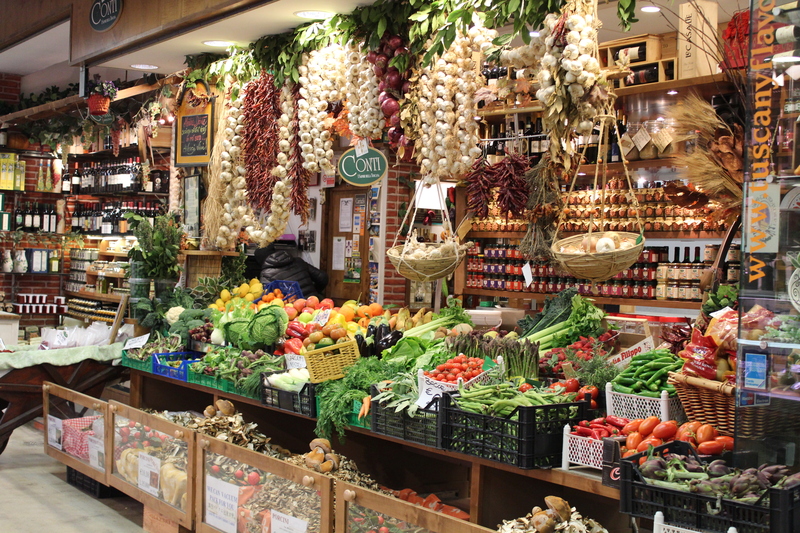 I’ve gained a new appreciation of my home and its local offerings, though I’ll always dream of the colorful outdoor markets across Europe and in Israel. Even though summer temperatures in Phoenix average 100+, our farmers markets are still lively in the early morning, and they’re a welcome reminder of the markets from my travels. Eating abroad made me really respect eating locally, which I intend to carry on into my new life at home. A good family friend gave me these tomatoes. They are gorgeous little gems bursting with sweetness and they were locally grown here in Arizona. All tomatoes should taste like this: so full of flavor and goodness, like summer dancing along your taste buds. I knew instantly what I wanted to make with them; a fresh and light tomato salad that I can’t get enough of, dressed with a simple basil vinaigrette that’s easy to whip up in a blender. I used three types of basil in my recipe so that I didn’t pick too many from any one plant in my garden, but you can use any type/combination of basil that you like. 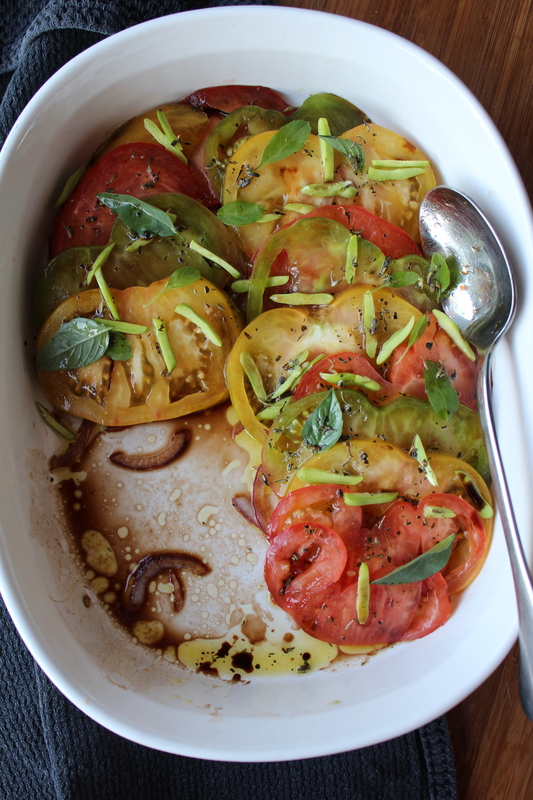 Cut your beautiful heirloom tomatoes into bite-sized pieces and place in a bowl. Add the rest of the ingredients to your blender and blend on high until the basil pieces are as small as they’ll get (or until they’re completely blended into the dressing, my blender is just not that cool). Taste the basil vinaigrette for salt and pepper, and adjust to your preferences if you think it needs more/less acidity. Lightly toss the tomatoes with the dressing. Let the salad sit for about 10 minutes to allow the flavors to blend together. Garnish with fresh basil and enjoy! This dressing keeps in the refrigerator for a week and is also great as a salad dressing. I imagine it would be delicious as a chicken marinade as well.